↑ "COUNTRY COMPARISON :: AREA". CIA. สืบค้นเมื่อ 10 April 2014. ↑ "COUNTRY COMPARISON :: POPULATION". CIA. สืบค้นเมื่อ 10 April 2014. ↑ "Hungary in the Carpathian Basin" (PDF). Lajos Gubcsi, PhD. 6 June 2017. สืบค้นเมื่อ 6 June 2017. ↑ Acta Orientalia Academiae Scientiarum Hungaricae. 36. Magyar Tudományos Akadémia (Hungarian Academy of Sciences). 1982. p. 419. ↑ "Austria-Hungary, HISTORICAL EMPIRE, EUROPE". Encyclopædia Britannica. 6 June 2017. สืบค้นเมื่อ 6 June 2017. ↑ "Text of the Treaty, Treaty of Peace Between The Allied and Associated Powers and Hungary And Protocol and Declaration, Signed at Trianon June 4, 1920". สืบค้นเมื่อ 10 June 2009. 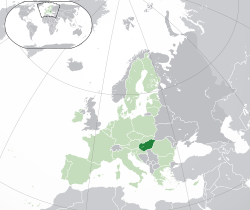 ↑ Hungary: The Unwilling Satellite Archived 16 February 2007 at the Wayback Machine. John F. Montgomery, Hungary: The Unwilling Satellite.http://kapos.hu/hirek/kis_szines/2018-06-16/megerkezett_az_idei_balaton_sound_himnusza.html Devin-Adair Company, New York, 1947. Reprint: Simon Publications, 2002. ↑ "Hungary: Emerging Economic Power In Central And Eastern Europe". Thomas White International. สืบค้นเมื่อ 18 June 2017. ↑ "List of OECD Member countries – Ratification of the Convention on the OECD". Oecd.org. สืบค้นเมื่อ 2011-11-04. ↑ OECD (June 27, 2013). "OECD Health Data: Social protection". OECD Health Statistics (database). doi:10.1787/data-00544-en. สืบค้นเมื่อ 2013-07-14. ↑ Eurydice. "Compulsory Education in Europe 2013/2014" (PDF). European commission. Archived from the original (PDF) on 6 November 2013. สืบค้นเมื่อ 19 May 2014. ↑ "Benefits of EU Membership". Hungarian Chamber of Commerce and Industry. 6 June 2017. สืบค้นเมื่อ 6 June 2017. ↑ "International organizations in Hungary". Ministry of Foreign Affairs. Archived from the original on 13 March 2016. สืบค้นเมื่อ 20 November 2016. ↑ UNWTO Tourism Highlights, 2016 Edition – World Tourism Organization. 2016. doi:10.18111/9789284418145. ISBN 9789284418145. ↑ "Search – Global Edition – The New York Times". International Herald Tribune. 29 March 2009. สืบค้นเมื่อ 20 September 2009. ↑ "Lake Balaton". Encyclopædia Britannica. สืบค้นเมื่อ 2008-03-20. หน้านี้แก้ไขล่าสุดเมื่อวันที่ 23 มีนาคม 2562 เวลา 05:22 น.